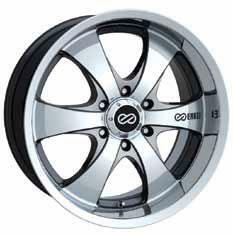 The Enkei M6 is Enkei’s newest MAT (Most Advanced Technology) truck wheel to hit the market. Using MAT technology to create the M6 allows it to be lighter and stronger than a traditionally cast truck wheel, which improves braking, handling, and acceleration. Offered in a mirror finish with silver pockets and deep polished lips, the M6 is not light on style either. The finishing touch is a perfectly proportioned Enkei logo on one of the spokes. In a world of “me too” truck wheels, the M6 is a breath of fresh air and is sure to improve the look and performance of any truck or SUV.